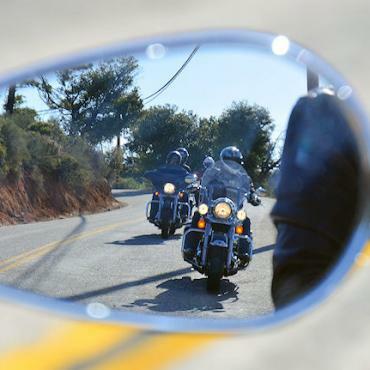 Being as safe as possible during your Harley holiday is our first priority. Being from outside the USA, road rules differ from what you’re used to. 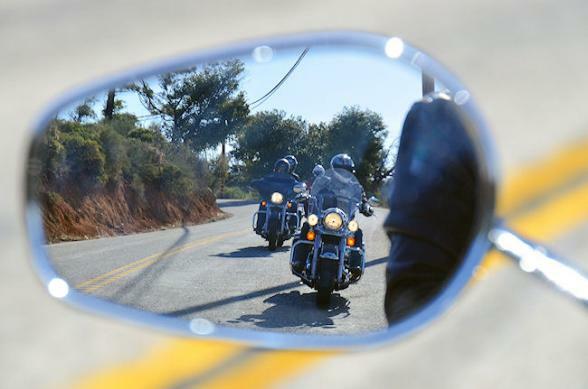 It’s worth a glance before you book a Harley Holiday. Once booked, you will receive a comprehensive list of road rules and laws. Staggered Riding - you must maintain a distance of 2-3 seconds behind the bike directly in front of you. If passing should happen within the group, you may need to switch positions to maintain the staggered formation. The only time you should not be riding in a staggered formation while in the group is at a red light or stop sign when you should be side by side and on more remote, winding roads where single-file riding and greater distances between bikes is more appropriate. Stop on red. Right turns ON RED are legal in many states but you must come to a full stop before proceeding. It is clearly marked NO RIGHT ON RED where this is not permitted. For yellow lights, if you are in or almost to the intersection it’s okay to proceed. If you are a few seconds away, slow to a stop. Don’t panic when approaching a yellow light! You won’t be left behind. A flashing red light is treated the same as a stop sign. Come to a stop, check for safety and then proceed. Come to a stop, check for safety and then proceed. Often, other vehicles will wait for the entire group to go through a stop sign but never assume. Freeway riding in America is quite the experience and speeds range from 60 mph to 80 mph. Most traffic holds speeds about 5 mph over the speed limit. The safest thing you can do is maintain the speed of your group. One of the most important issues to be aware of is passing large transport trucks – the USA is full of big rigs! A good rule is – if you can see the entire front of the truck in your rear view mirrors, then it’s okay to move back into their lane after passing. Groups must pull over for emergency vehicles whether they are passing the group or oncoming. When you are in a group, just follow the Guide's lead. If an emergency vehicle is pulled over and stopped on the shoulder of the road, move to the left, if possible, to pass them. This also goes for vehicles that may be stopped on the side of the road. *If you are ever pulled over by the police, stay sitting on your bike unless specifically told otherwise by the police – do not approach the officer. Prior to your departure, you’ll receive a welcome packet explaining the hand signals used. The most important thing is when you see the Guide make a signal, that you pass it down the line so the last bike knows what’s coming up. 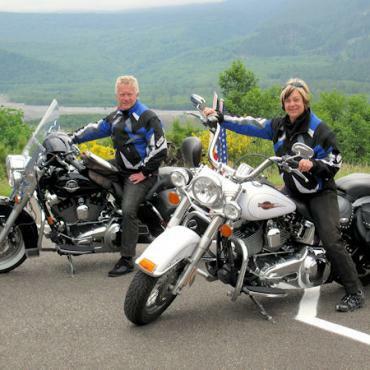 Weather - it is not unusual on any two-week tour to ride through just about every type of weather. Your Guide will help you to be as prepared as you can for the days potential weather by sharing with you what to expect and how to dress. With the exceptions of tornadoes, severe lightning storms and hail or heavy snow, you’ll generally ride through any weather to keep on course. Both your Guide and your Van Guide will be updated on the weather on an hourly basis and making adjustments accordingly. These are just the basics to get you started. 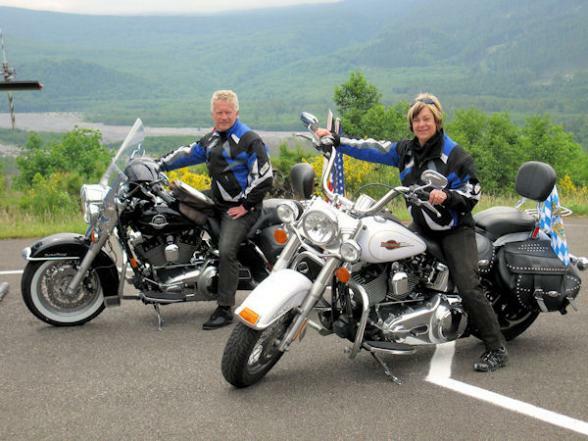 Prior to departing on a Harley holiday, you will be given a much longer, comprehensive list of driving rules and tips.